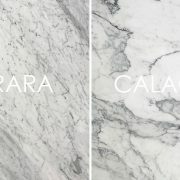 Carrara v Calacatta – What’s the Difference? 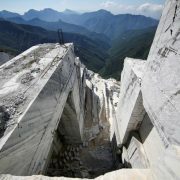 A look into a Carrara quarry. White marble, dark-veined, Italian origin. Both stones are highly desirable and have been used for centuries. From the construction of cathedrals to Michaelangelo’s most famous sculptures to your next-door neighbour’s kitchen benchtop. These white marble beauties have been quarried from the Carrara mountains since antiquity and show no signs of stopping – this is where the most volume of marble in the world is produced! For two types of natural stone that are quarried from the same region of Carrara (but from different parts of the mountain!) and commonly mistaken for the other, there are a few points of differences that set each marble apart. Here are 3 quick ways to tell how. Carrara marble comes in varying shades of blue-grey, described as being “muddier in colour” when next to a piece of Calacatta. The veining is smaller, softer and tends to be more linear. Sometimes Carrara can appear granier. A true piece of Calacatta marble is pure white, with darker, more dramatic and prominent veining. People have believed for many years that the more expanses of white on the stone, the more desirable. Carrara and Calacatta are easily told apart by their veining. All photos of actual stock. And from both Carrara and Calacatta comes more different styles. Statuario is a version of Carrara but with bolder, bigger expanses of grey veining. Calacatta Oro is a stunning varation of Calacatta, with chunky gold veining. All photos of actual stock. Carrara is the most common stone from the Carrara region, and is produced in abundance! You’ll find no shortage in the mountains nor the household. Just some of the Carrara range available at Victoria Stone Gallery. All photos of actual stock. With Calacatta however, there is less availability and it is much rarer. This plays a big part in why Calacatta is considered one of the most luxurious and sought-after marbles. Calacatta Extra bookmatched. All photos of acftual stock. Believe it or not, Carrara can be as inexpensive as Granite. Because of its availability, it is generally a lower cost than the rest of the Carrara grades. But we are talking the opposite end of the spectrum when it comes to the cost of Calacatta. Considered the most luxurious, this is the most high-end, high-priced natural stone you’ll find on the market. They say, the whiter the Calacatta, the higher the cost. Does this mean one may be more maintenance than the other? No. Besides the difference in price and popularity, Italian marble is still made up with calcium which means that both Carrara and Calacatta are porous and more susceptible to etching. But, with the right amount of TLC and upkeep of a protective sealer, a Carrara benchtop will see you through for many years. Now just to decide – Carrara or Calacatta? Consider the look that you like and the budget that you can work with. We’ve got the availability covered right here! 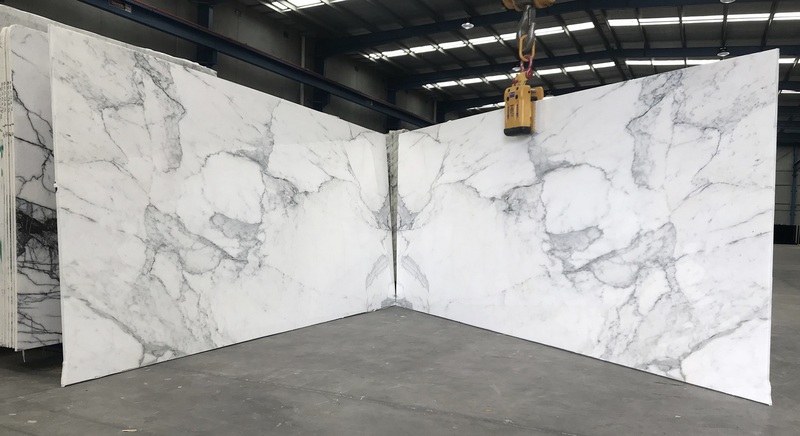 https://victoriastonegallery.com.au/cms/wp-content/uploads/2018/11/calacatta-v-carrara-1.jpg 604 1215 victoriastonegallery victoriastonegallery https://victoriastonegallery.com.au/cms/wp-content/uploads/2017/05/icon-white.png victoriastonegallery victoriastonegallery2018-11-07 14:30:032018-11-08 14:44:52Carrara v Calacatta - What's the Difference? 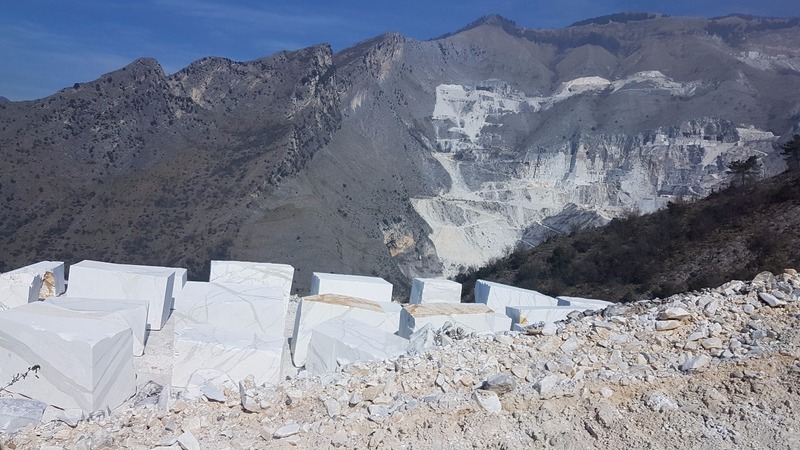 Read the article below for an insight into how Italy’s Carrara Marble Quarry is standing now and still one of the most desirable choices of stone. Browse our range of Carrara marble. For many people, that white gold is not metal but marble from the town of Carrara in Tuscany. The marble mining work in Carrara is ancient. Workers first began removing stone from the mountains of Tuscany more than 2,000 years ago. The ancient Romans were the first to recognize the beauty of the marble. Millions of people still go to Rome to see famous monuments made with the stone. Two examples are the Pantheon and Trajan’s Column. And then there are famous statues like the David and the Pietà by the sculptor and painter Michelangelo. So what is happening in Carrara today? Sculptors, other artists and designers of buildings have never stopped making trips to the Tuscan town. M.J. Anderson, an American, first visited Carrara 36 years ago, when she started creating sculptures. She loved the look of the beautiful stone. Anderson says she likes to take things apart. “The great thing about carving marble is that once that stone is gone, it’s gone. You can’t lament about it and this keeps you moving forward in the creative process,” she said. Sculptors like Anderson know they are dealing with something very special. That is what is bringing in orders and big money from all over the world. Carrara’s marble is in great demand in the Arab world and in countries like China, India and Thailand. Buyers want the material to use in the rooms and floors of their homes. Others want art made of the stone. For example, a few years ago, a request came for a huge block of marble to be used in a massive statue of Buddha. An increase in the building of mosques and Islamic centres, especially in the Arab world, has meant even more demand and big business for some marble companies. The Saudi Binladin Group, one of the world’s largest builders, got control of 50 percent of Marmi Carrara in recent years. Marmi Carrara owns a third of the marble quarries that are operational in the area today. “Just the name Carrara basically says it’s the world’s best marble. It is the most beautiful. It has a centuries’ long history of being the best marble in the world and people come here looking for and wanting the very best,” Anderson said.